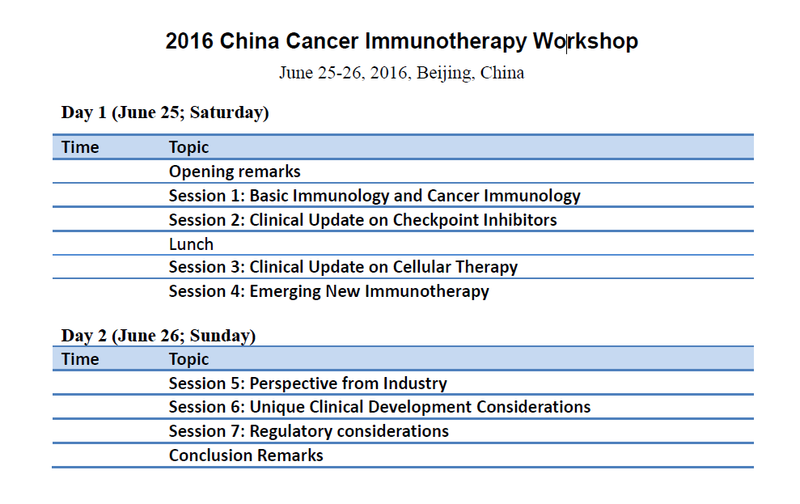 CDDF will join forces with the Chinese Center for Food and Drug International Exchange (CCFDIE) during the 2016 China Cancer Immunotherapy Workshop on June 25 & 26, 2016 in Beijing, China. Recent years have witnessed rapid development and explosion of cancer immunotherapy which has been viewed as “historic breakthrough” in modern cancer treatment. Scientists and physicians increasingly focus on discovery and clinical development of new cancer immunotherapeutic agents. Doctors and patients are increasingly expecting more options the immunotherapy can offer to treat and may eventually cure cancer. In the meantime, these new advances and challenges necessitate physicians, scientists, and regulators to continue their education in learning and keeping abreast with the latest development in cancer immunotherapy. To enhance the knowledge and exchange of cancer immunotherapy in China for the benefit of all patients, especially those in China, China Center for Food and Drug International Exchange (CCFDIE), in cooperation with the Center for Drug Evaluation (CDE) of CFDA and Chinese American Hematologist and Oncologist Network (CAHON), are planning this 2016 China Cancer Immunotherapy Workshop. Leading experts from academia, regulatory agencies in EU and US and industry will be invited to share their views and experiences in basic cancer immunology, update on cellular therapy and checkpoint inhibitors, emerging new immunotherapy, and the unique clinical development and regulatory considerations. The target audience includes oncologists, scientists in oncology drug development from academia and industry, and government officials.